*Ford Certified Pre-Owned Comprehensive Limited Warranty coverage is provided for 12 months or 20,000 kilometers (whichever comes first) from the expiration of Ford New-Vehicle Basic Warranty or the date of your Certified Pre-Owned vehicle purchase, whichever comes later. The coverage provided by the Ford Certified Pre-Owned Comprehensive Limited Warranty is not as extensive as that provided under the New-Vehicle Limited Warranty. See dealer for full details. There's added value to a Ford Certified Pre-Owned vehicle. 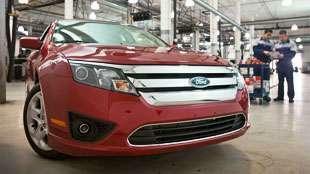 Only well-maintained recent model year Fords even qualify for our program. Combined with one of the most rigorous inspection in the industry, and backed by one of the most inclusive Certified Pre-Owned warranties* – you are not only purchasing a great Ford vehicle, you are making a wise vehicle investment. As experts in the Used Car industry, we sought out Canadian Black Book’s expertise to ensure our Ford Certified Pre-Owned Program delivered industry leading value and coverage while operating at the highest standards of vehicle selection and reconditioning. The end result is the industry’s first and only Certified Pre-Owned Program endorsed by Canadian Black Book®. * Ford Certified Pre-Owned Comprehensive Limited Warranty coverage is provided for 12 months or 20,000 kilometers (whichever comes first) from the expiration of Ford New-Vehicle Bumper-to-Bumper Limited Warranty or the date of your Certified Pre-Owned vehicle purchase, whichever comes later. The coverage provided by the Ford Certified Pre-Owned Comprehensive Limited Warranty is not as extensive as that provided under the New-Vehicle Limited Warranty. See dealer for full details. ** Included concurrently with your Ford New Vehicle Limited Warranty and most Ford Extended Service Plans. Roadside assistance is available 24 hours a day, 365 days a year across Canada or the Continental U.S. Services are provided by Sykes Assistance Services Corporation. Services include: Flat tire change; Battery jump starts; Towing assistance up to $100; Lockout assistance; Out-of-fuel assistance; Travel expense; reimbursement up to $500 for up to three days’ lodging, meals and rental vehicle for travel expenses accrued when the breakdown occurs 160 Kilometers or more from home; Destination assistance covers taxi, shuttle or rental car expense up to $75 for emergency transportation to the immediate destination. See dealer for full details.